It's no secret that I'm a bit of an art museum nerd. I've trekked across cities all over the world just to step foot in certain museums, and it's likely that given even a few hours of free time, I can be found wandering amongst the statues and paintings of the Met. So I was actually a little disgusted at myself when I realized that there was an entire art museum a mere 15 minute walk from my apartment and I hadn't once visited it in the four years I've lived in Astoria. I vowed to change that asap, and there was no better time than during this 30x30 challenge. So on a blustery day in November, I took advantage of the museum's "First Friday" policy (a lovely program that allows patrons to pay-what-they-wish on the first Friday of every month) and walked over to The Noguchi Museum. 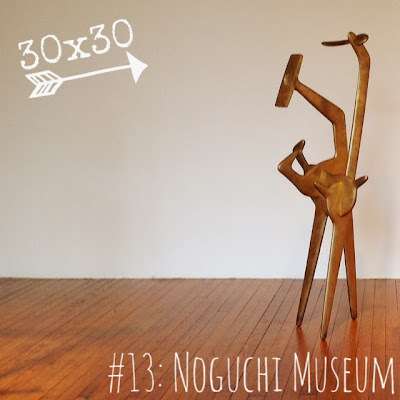 Named after and designed by 20th century sculptor Isamu Noguchi, the museum is conceived to be an open-air sculpture garden, housing what Noguchi considered to be some of his best works. I thoroughly enjoyed my time at the museum. It wasn't at all crowded (note to self: stop being an old lady) and it was perfectly peaceful to wander the naturally-lit galleries, getting in touch with my inner Zen amongst the wabi sabi of the minimalist wood and stone carvings. It was a relatively small space - the entire experience took about an hour, and that was with circling back to view some galleries a second time. But the museum's accessibility (in terms of content, that is) is one of it's stronger points. While the Met is famous and amazing and spectacular, it is so incredibly huge that first-time or casual visitors can and do get so overwhelmed that it's hard to visualize just popping over for a quick and quiet visit. But the Noguchi is just the opposite - it's actually perfect for a lunchtime recharge (provided you're in the area), and makes me wonder if more museums shouldn't be designed with this idea in mind. Not everything has to be flashy and designed by a starchitect. Sometimes it's nice to just appreciate good art. If you go: The Noguchi Museum is located 9-01 33rd Rd. (at Vernon Blvd.) in Long Island City; take the N/Q to Broadway and walk towards the river. The museum is open Wednesday-Sunday and is pay-what-you-wish on the first Friday of every month.